24 Hour Kid's Toys Flash Giveaway! 24 Hour Kid’s Toys Flash Giveaway! SO excited to participate in this flash giveaway full of awesome kid’s toys today! Be sure to enter; it end’s in 24 hours! We are cruising right along with our Gift Guide Giveaway. Today we are all about toys! Remember, one winner will win all of the gifts in this post!! That’s worth almost $1300!!! Good luck – you only have 24 hours to enter! To learn more about the products that will be given away or to read our full review click here. HIT Entertainment knows a lot about fun! With fun characters like Thomas the Tank, Angelina Ballerina, Barney and more they are in the business to make kids smile! To learn more about the products being given away and to read our full review click here. Learning Express is my favorite toy store ever! With locally owned shops that are so welcoming with the nicest employees, toys out for the kids to explore and only carrying high quality toys they are definitely my first stop when it comes to buying toys! You can find a store near you here. Rhinestone Wrap Bracelets, Lots of Knots, Magical masterpiece, Get Wired, Trendy Hair Ties, Shoelace Jewelry, DIY Ornaments (in multiple styles! ), Wordaround Holiday, Spot it Holiday, Stomp Rocket, and Sling Shot Kit. Yeah. That’s a lot!! WHEW!! To find out more about the items that are being given away and our full review click here. To find a location near you and shop at Learning Express click here. Lundby is a European company (now available in the US!) that makes the most amazing doll houses. The Smaland House (above) has plenty of room, the windows all open and each room is prepped for electricity! Yep! The house is decorated perfectly and if for some reason you need more room you can add on another floor or a garden! The furnishings are just as cute! One winner will win a Smaland Doll House, electricity kit, Doll family, and furniture! To find out more about the products that will be given away and our full review click here. To purchase Lundby products click here. Plan Toys are the place to go for sustainable play! Their toys encourage imaginative play, problem solving and creativity. Extremely well made and cute to boot these would make the perfect gift for any child! To find out more about the products being given away and to read our full review click here. Red Wagon Toy Company has tons of great toys for kids! One of my favorites is Rody! Available in a wide variety of colors Rody is fun toy kids can bounce on. It is perfect for developing coordination and balance! One winner will receive 2 Rody toys! To purchase Rody click here. If you have science fans you need to get some Science X Kits from Ravensburger!! There are tons of kits to choose from including the ones above!! Each kit is packed full of fun activities to do and things to explore. Kids have so much fun they don’t even realize how much they are learning! To read our full review of Science X and find out more of the products that will be given away click here. Style Me Up is the perfect gift for tweens! Fun, fashionable, age appropriate and affordable Style Me Up has everything from sketchbooks to jewelry kits to nail polish kits! One winner will win a $100 prize pack from Style Me Up! To learn more about the products that will be given away as well as our full review click here. To purchase Style Me Up products click here. 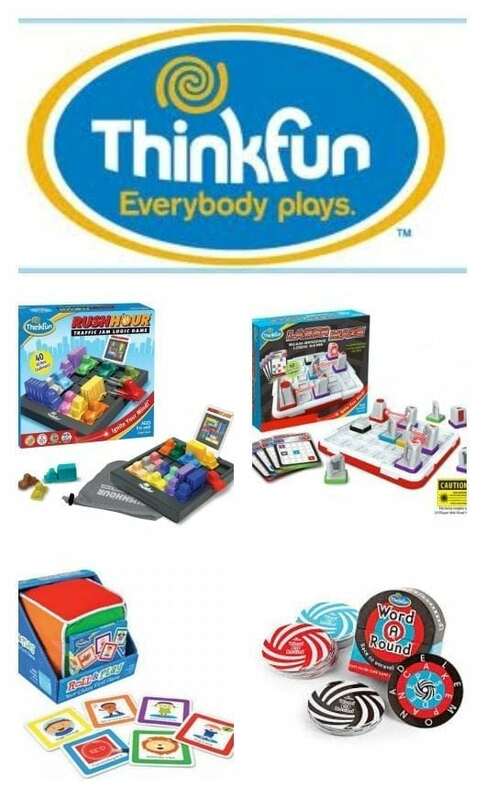 Thinkfun has been winning awards for their games since the beginning! Their games promote not only fun, but creativity, problem solving, literacy and more! Their games are designed for toddlers to adults so there is something for everyone. To find out more about each of the products being given away or to read our full review click here. Winning Moves has game night covered! If your family loves playing games then this is THE best place to shop! They have classic games, new games and classic games with a twist. I love being able to share my favorite games I played as a child with my son! To read our full review on Winning-Games or to get more information on the prizes being given away click here. One winner will win all of the items mentioned in our Top Toys! Almost a $1300 Retail Value!